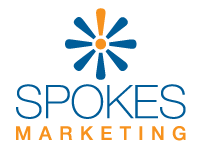 At Spokes, we’re a different kind of Ad Agency! As a premier provider of marketing in the Mid-Atlantic area, we’re well-positioned to provide a full suite of advertising agency services. We can be your Agency of Record and put together integrated advertising campaigns. We put your needs first and can work with you as a Full-Service Agency, Creative-Only or Digital-Only agency. As a Full-Service Ad Agency, we will provide you with a full-time Account Manager who will supervise your account, including putting together a comprehensive strategy and then implementing that strategy. The implementation will likely include a media plan and messaging concepts. Then we’ll develop creative that could include TV, Radio, Print, Direct Mail, Online and more. Our unique position is that we look to maximize your return on investment by measuring all the media that we run and showing you each month how your media is producing leads in comparison to all the other media. We look at past months and trends as well. Each month we put together a plan and report based on prior month activity so that you know at every step what’s going on with your advertising. We’re a different kind of agency – one focused on activity and results! Contact Us for more information about how we can help you grow your business and maximize your marketing. Do you need the help of a full-service ad agency?